I once owned an MGB. I liked it. It was a fun car that I have a lot of good memories of. I'm glad I owned it. But, it's part of my past. When I see an MGB these days I don't get all nostalgic. I don't have any burning desire to own another one... Until now. This is not a stock MGB. This may be the perfect MGB. 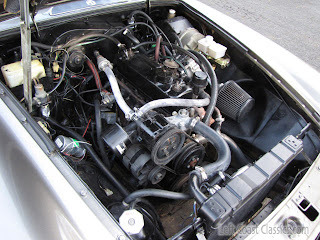 Gone is the Zenith side-draft carb, replaced by a Moss Motors fuel injection set up. Gone are the antique lever shocks, replaced by more modern tube shocks. Gone is the tin foil exhaust system, replaced by a "great sounding" stainless steel system. Gone too, is the oh-so-seventies "Inca Yellow" paint, replaced by a very classy pewter color. Besides all that, there are some nice "touches" added to this car. There are a pair of really nicely done wooden door caps. 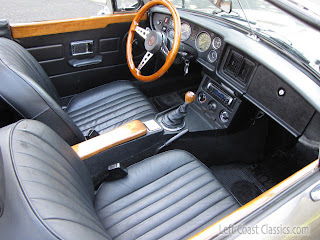 There's a really nice chrome/wood steering wheel. The seats are now covered in real leather. The trunk is now carpeted. There's not much more I can say about this car. It's a car that has been done really, really, "right". Everything that was added to this car was available in 1978. Fuel injection, tube shocks, stainless steel exhaust; they had all been around for at least a couple of decades before this car was built. 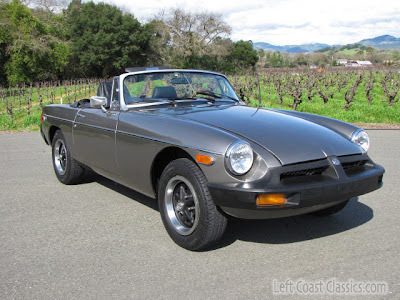 This is a 1978 MGB built like a 1978 MGB should have been built in the first place. The seller provides a link at the bottom of his eBay listing to a few short videos and 200 additional pictures. Check it out. It think a retrofitted chrome grille (aka "rubber to chrome bumper conversion"...) would make a nice finishing touch. Melanie Griffith had some Botox injections that gave her lips a similar look not too long ago.